2018 is proving to be quite a year for smartphone enthusiasts. All these years, peak performance was reserved for phones that fetched a premium price tag. Only this year, flagship-grade performance can be had for less than half the price of a flagship phone. With phones like the OnePlus 6, Poco F1, Asus Zenfone 5z and the Honor Play, prowling the market, making a case in favour of these premium flagships is becoming more and more difficult. There are some features that set the premium phones apart from the rest, even today. They include a premium design, consistent camera performance, water resistance and the likes. But if pure performance is what you’re looking for, it’s a lot more affordable with a whole lot of options. To help you make the right choice, we pit the most popular budget flagships against each other in a performance showdown. We gamed on each of the phones for hours, launched apps, used it as daily drivers and kept an eye on the battery level and finally, we have a verdict. But first, let’s see what these phones bring to the table in terms of hardware. 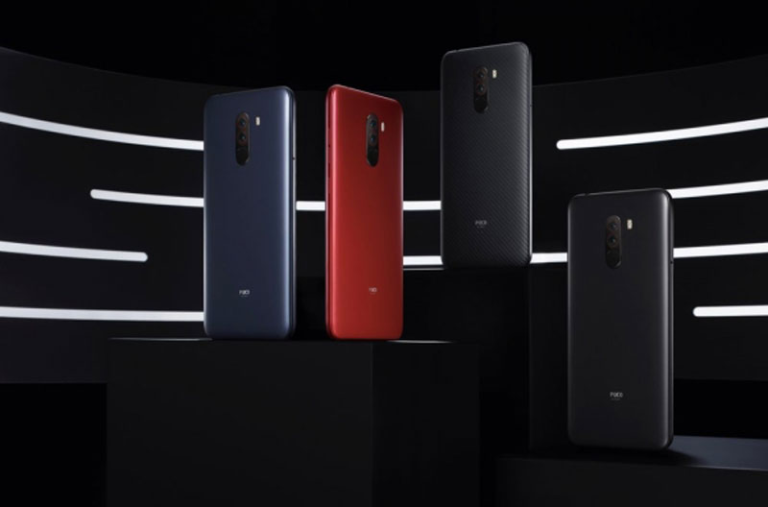 The Poco F1 is the newest kid in the block and it’s already a best-seller. 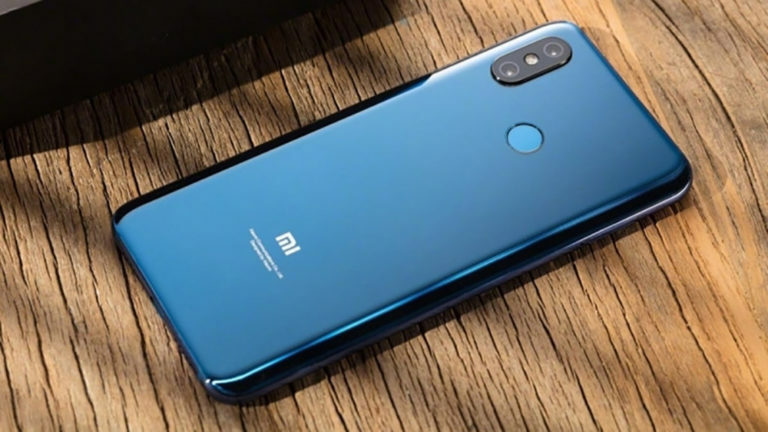 The phone went on sale today for the first time and registered sales worth two crores for the Xiaomi-owned sub-brand. Equipped with a Qualcomm Snapdragon 845 chipset combined with a dedicated cooling contraption, it’s here to put all the other flagships to shame. There’s up to 8GB of RAM and 256GB of storage and it’s all packed in either a hard polycarbonate shell or a kevlar-layered body. Up front is a 6.18-inch notched display that’s perhaps the most uninteresting part of the phone. But hey, like with every new generation, the kids only seem to get smarter and better. The next contender is a similar offering, but from Honor. The Honor Play brings Huawei’s flagship Kirin 970 SoC down to the sub-Rs 20,000 segment. Granted the chipset is now a bit aged, but the Honor Play has some software trickery to make up for it. The phone is powered by Huawei’s proprietary GPU Turbo tech. We explored the advantages of the technology in an earlier feature and noted the improvement it gives in performance. There’s also 6GB of RAM to boot and 64GB of storage to go along with it, all packed in a smooth metal body with a 6.3-inch IPS LCD notched display on top. The Zenfone 5z is the dark horse among the four. Asus’ flagship phone for 2018 is proving to be quite the contender and it’s pricing only makes it better. At Rs 29,999, you get an iPhone-X lookalike powered by the Snapdragon 845 along with 8GB of RAM and 256GB onboard memory. It’s claim to fame is the myriad of AI features that helps make the phone run buttery-smooth. Finally, there’s the OnePlus 6. It’s the phone that comes to mind when you think of a flagship killer. OnePlus has been doing this for a while and the OnePlus 6 is no different. It also packs the powerful Snapdragon 845 SoC coupled with up to 8GB RAM and 256GB storage. It also looks the most premium out of the lot with a glass-sandwich design and it even has a 6.28-inch AMOLED panel to boot. Most of these phones are powered by flagship processors with max clock speeds that go all the way up to 2.8GHz. The processors have eight cores arranged in a big.LITTLE architecture where the processing load is distributed efficiently based on the magnitude of it. Most apps and services are optimised to run efficiently without taxing the CPU much. As a result, stressing the CPU is a lot more difficult in this day and age. Gaming is one big indicator. It requires the high performance cores in full gear along with the GPU and a lot of free memory. It’s a given fact that if a smartphone can run a high-graphics game smoothly, it should do well in other day-to-day tasks as well. We played three games — PubG Mobile, Dead Trigger 2 and Injustice 2. We clocked the median frame rate achieved by each of the four phones, along with their variability index and power consumption. Word to note here is that, all the phones managed to max out the frame rates in most of the games we played. The key to judge the better performer is the variability index which shows how often the game ran on the median frame rate. Furthermore, power consumption readings gave an idea of efficiency. The smartphone that consumed less power for doing the same task is deemed more efficient. Next, we tested real-world performance. For this, we used a program to simulate multiple app launches to see if there’s any impact in app launch times. We kept a buffer of two seconds for apps like Facebook, Instagram, Google Chrome and a buffer of 10 seconds for PubG Mobile. Along with that, the program also simulated actions like dragging the notification drawer, pull up the app drawer and the likes. This allowed us to resemble daily usage to a big extent. Once the simulation ran, we noted down the time in seconds it took for the phones to complete the run. The fastest phone wins. Now, each contender in this showdown has got some trickery up their sleeves. 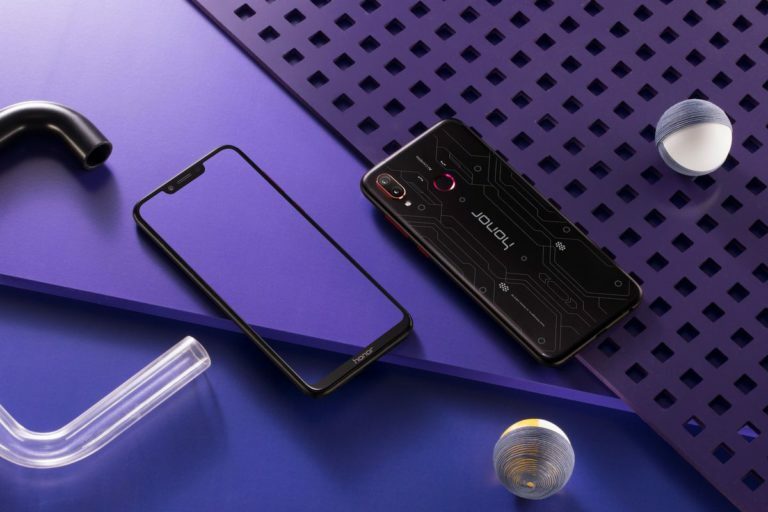 The Poco F1 has LiquidCool to cool down the CPU cores. Honor Play’s GPU Turbo takes specifically optimised games and apps and runs them butter-smooth. The Asus Zenfone 5z uses every bit of the Snapdragon 845’s AI Engine to optimise resources for an overall smooth experience. The OnePlus 6 relies on its UI optimisations and the flagship chipset’s raw performance to perform. Among the games played, PubG Mobile seems to be the only game that pushes the frame rates to the 40fps mark. The Honor Play achieves it. 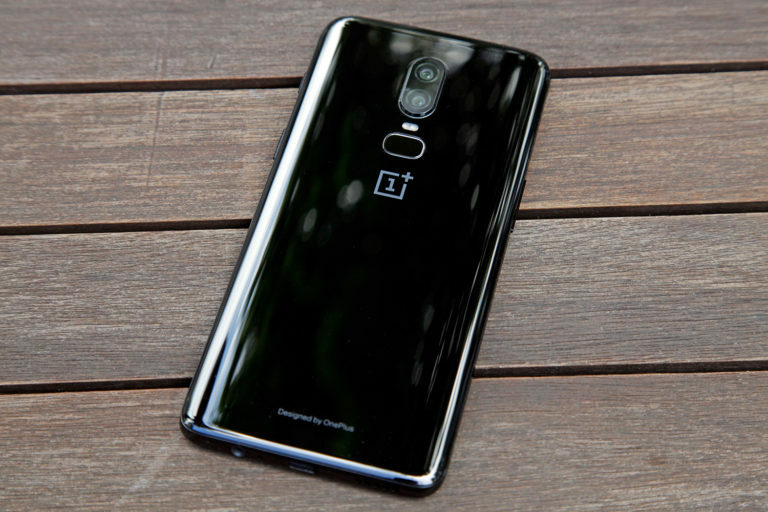 The OnePlus 6 is the second past the post. The Zenfone 5z caps the frame rate at 39fps as well.The Poco F1 comes close with 38 fps. Mind you, all the four phones have been claimed to be optimised for the popular Battle Royale game. As for the others, Dead Trigger 2 and Injustice 2 ran equally well on all the phones. FPS doesn’t give the full picture though. That’s the average frame rate of the session. The variability index shows how often you are playing in the frame rate. A lower score is better and in this case, the Poco F1 seems to be more stable. It sort of verifies Poco’s claim of sustained peak performance. The Zenfone 5z’s FPS fluctuates the most. If smooth gaming if what you’re after, the cheapest of the lot seems to be the best fit. Smartphones need power to deliver stable performance and in that case, the Poco F1 and the Honor Play seems to be almost at par in being efficient. 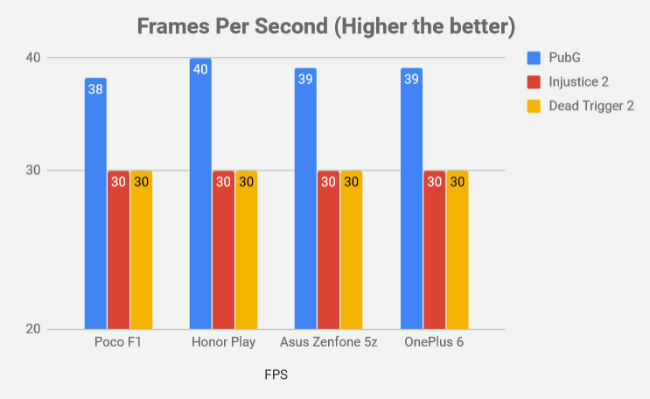 The Zenfone 5z was fairly efficient in PubG Mobile, but required a lot more juice to run Injustice 2. In case of the OnePlus 6, it was the opposite. 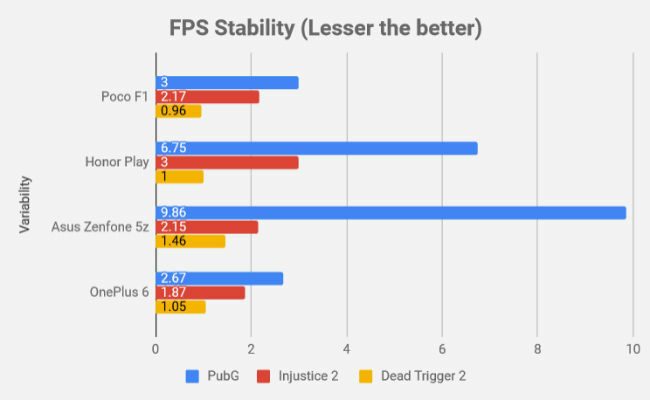 The Poco F1 comes out as the consistent performer when it comes to gaming. It’s frame rate, stability and power efficiency were all less than the competition. The Honor Play comes a close second and GPU Turbo is much to thank for. An observation here is that even in games not optimised for the tech, the battery consumption was lower. 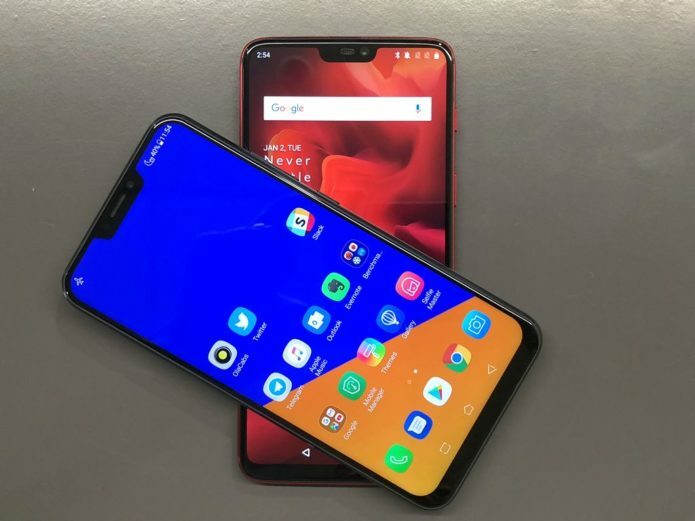 The Zenfone 5z and the OnePlus 6, somehow wasn’t so stable. Although, gameplay experience was more or less the same in all these phones. The data in this case is taken at 300ms intervals (for the FPS). Change that quick will not be noticeable to the naked eye. Gaming could be a major reason for getting a high-performance, but not the only one. Some require a fast, snappy phone at their disposal every minute while some actually get work done on their phones. A laggy experience is never a good thing. So, to aid with smooth day-to-day performance, the contenders in this showdown have made some definitive adjustments. All the phones excluding the Honor Play is offered with 8GB of LPDDR4X memory and upto 256GB UFS 2.1 storage. The highest standards of memory is used to prevent any bottlenecks, and the results show. We ran a simulation where we launched seven commonly used apps and a popular game – Facebook, Google Chrome, Instagram, Reddit, Google Maps, YouTube, Google Sheets, and PubG Mobile. Furthermore, we sprinkled the simulation with incoming notifications, pop up messages, dragging the status bar, going to the home-screen and the likes. The actions are similar to how we’d use our phones in our daily lives. The OnePlus 6 stands true to its claim of ‘the speed you need’. It completed the simulation in 40.42 seconds, the fastest among the lot. The other three budget flagships all took around 42 seconds with the Honor Play, a hair faster than the rest. Clearly, the optimisations OnePlus made under the hood of the OxygenOS UI works. As a matter of fact, it could be also be because of faster transition animations. The best part was to see PubG Mobile load to the start screen in less than 15 seconds. It’s not that the other three phones are slow. 42 seconds to do all that is not a joke. All the four phones are blazing fast and in real-life, you won’t really feel the difference. Once the tests were done and the charts compiled, the result at the end wasn’t what I had predicted. It turns out the cheapest phone of the lot is the fastest when it comes to raw performance and gaming. The Poco F1 retained high frame-rates for longer with the highest stability. The Honor Play comes close to it for the games it is optimised for. 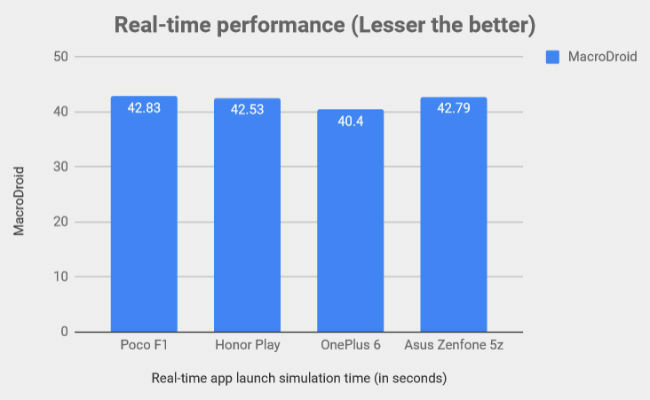 The OnePlus 6 comes out on top in real-time performance. The software optimisations make apps launch blazing fast. 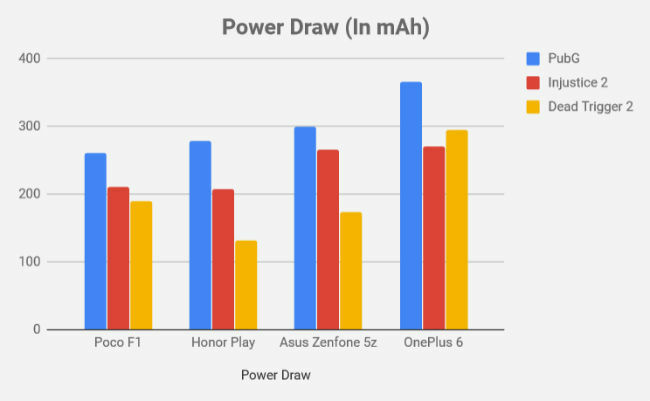 However, as we saw in our gameplay tests, the OnePlus 6 is more of a power guzzler than the Poco F1. Having a thermal stabiliser helps in keeping things efficient. Then again, if pure speed is what you’re seeking, you won’t be disappointed with any of these four. 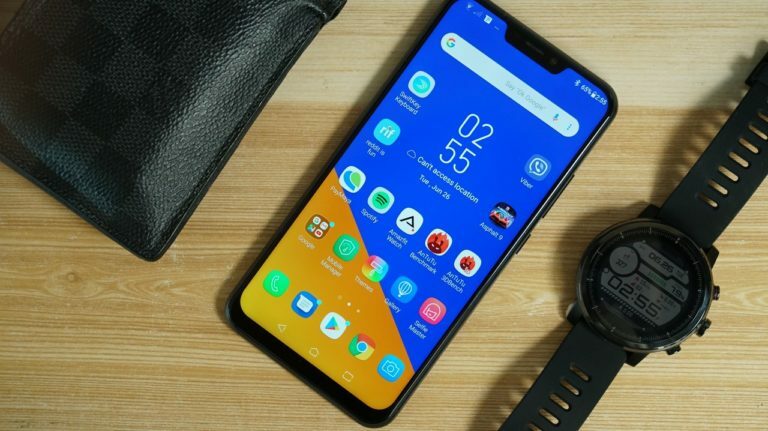 The Poco F1, Honor Play, Asus Zenfone 5z and the OnePlus 6 are all well-made and well-optimised devices that makes it hard to argue in favour of the premium flagships.